[Alex Lao] has been playing around with the CPLD-like parts of a PSoC. Which is to say, he’s been implementing simple logic functions “in hardware” in software. And after getting started with the chip by getting accustomed to the different clock sources, he built a simple AM radio that transmits at 24 MHz. The device that [Alex] is learning on is a Cypress PSoC 5LP, or more specifically their (cheap) prototyping kit for the part. The chip itself is an ARM microprocessor core with a CPLD and some analog tidbits onboard to make interfacing the micro with the outside world a lot easier. [Alex] doesn’t even mess around with the microprocessor, he’s interested in learning the CPLD side of things. He starts off with a 24 MHz carrier and a 1 kHz tone signal, and combines them with a logical AND function. When the tone is on, the carrier plays through; that’s AM radio at its most elemental. Everything is logic (square waves) so it’s a messy radio signal, but it’ll get the job done. 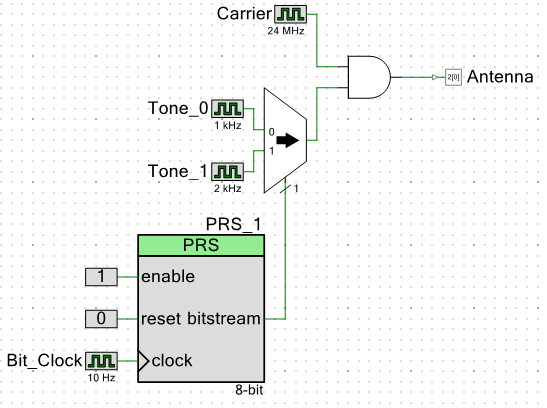 Adding a multiplexer up front allows [Alex] to play two tones over his “radio” station. Not bad for some simple logic, and a fantastic Hello World project for a CPLD. We can’t wait to see what [Alex] is up to next! If you’re interested in getting your feet wet with either CPLDs in general or a CPLD + micro system like Cypress’s, the development kit that [Alex] is using looks like a cheap and painless way to start. (Relatively speaking — PSoCs are a step or two up a steep learning curve from the simpler 8-bit micros or an Arduino.) Hackaday’s own [Bil Herd] has a video on getting started with another member of the Cypres PSoC family, so you should also check that out. At the beginning of the Month we came across a coupon code for a free eZ430-F2013 development stick. TI has given these things now and again so we took the opportunity to acquire one. It arrived yesterday and we’ve spent just a bit of time looking it over. Above you can see the first project completed; Hello World on a salvaged Nokia cell phone screen. Join us after the break for our thoughts on the device, as well as more pictures and details.